Enterprises are looking for trusted, innovative service providers to help them overcome mass data fragmentation and harness the value of their secondary data and apps. Meet customers’ needs with one, hyperconverged platform ensuring all secondary workloads are protected and productive across multi-clouds. Gain access to a $60B market and new business models with one web-scale secondary data and apps platform for multiple use cases—from backup and recovery to test/dev to analytics. Eliminate specialty silos. Deliver multi-cloud services with consistent infrastructure and operations. Securely host tenants at scale. Deliver non-disruptive upgrades and instant mass restore. Support self-service and BYO encryption key. Offer unparalleled insight to untapped data. Enable seamless data mobility across clouds. 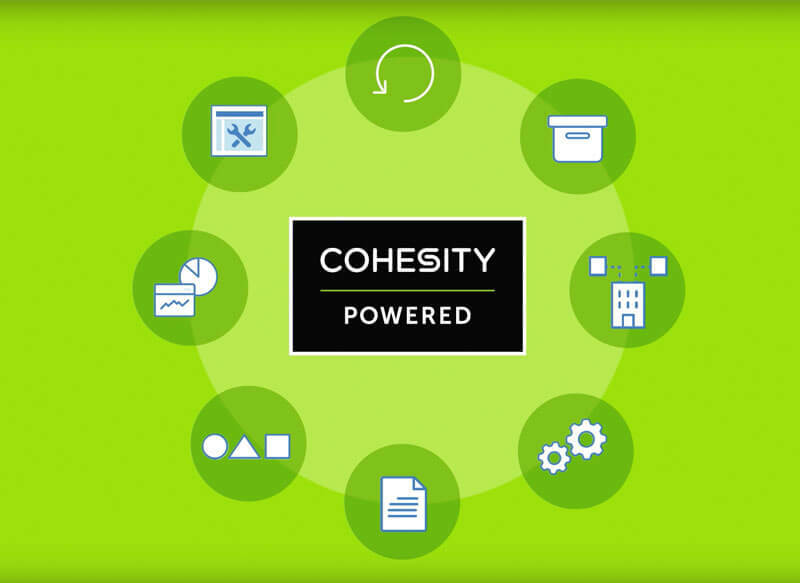 Move up the value chain with Cohesity. Build one, several, or an entire catalog of profitable, Cohesity Powered as-a-service secondary data differentiation across clouds at lower cost. Scale as you grow and customers consume. Support customer backup and recovery with a variety of options, including on-site data protection, direct backup to cloud, and cloud-native backup. Support long-term data retention and compliance requirements across clouds with easy data access through Google-like search. Offer reliable off-site protection and ensure business continuity with instant mass recovery in case of a catastrophic event at a primary site. Offer scale-out NAS for user home directories, departmental network shares, and group collaboration. Offer S3-compatible object storage for unstructured data storage and retrieval. Enable test/dev in the cloud to speed application delivery. Support agile iterations, rapid clones, and quick tear down of test/dev environments. Help customers gain insights into untapped data and turn them into actionable intelligence. Streamline compliance and provide proactive and predictive analytics with in-place search and analytics workbench. Custom secondary data and apps services, for example security as a service for ransomware recovery, using Cohesity’s API-first architecture and RESTFUL APIs. Deliver solutions that accelerate business outcomes. Join the Cohesity Partner Program for Service Providers and benefit from co-design workshops, cloud-ready testing, training programs, premier technical support, proposal-based funding opportunities, and more. New purpose-built solution, expanded partner program, and Cohesity Powered trust mark enable Service Providers to monetize secondary data & apps services across clouds while accelerating customers’ journey to multi-cloud / hybrid IT. Cohesity modernizes data center architecture, extends to cloud, and helps organizations develop for cloud. Cohesity’s flexible, future-proof, service provider-ready platform meets industry regulations while addressing use cases from core to edge to cloud. Securely support multiple customers at once. Cohesity safeguards data at both the management and infrastructure levels with secure namespace isolation and encryption of data at-rest and in-flight. Consolidate secondary data and app workloads—data protection, files, app development, object storage and analytics—on the Cohesity software-defined platform. Optimize TCO and ROI with a choice of Cohesity, Cisco, HPE, or Dell servers/appliances. Achieve the highest levels of storage efficiency and reduce costs across tenants with Cohesity cross-tenant deduplication. Cohesity SpanFS delivers unlimited scalability, guaranteed data resiliency, and advanced global deduplication. Simplify operations using pre-built integrations with VMware vCloud Director, VMware vRealize Suite, ServiceNow, and options for self-service tenant login directly from Cohesity. Cohesity’s API-first architecture and full-featured REST APIs support business demands and meet SLAs. Take advantage of fine-grain, role-based access control, audit logs, and built-in reporting to protect and secure operations, address regulations such as GDPR, HIPAA, and PCI, and streamline compliance audits. Gain unprecedented global access, visibility, and control of secondary data and apps across all Cohesity Powered sites—on-premises, in the cloud, or at the edge with Cohesity Helios SaaS-based management from a single dashboard. 77% of service providers will require some level of IT transformation over the next three years to meet the changing needs of their customers and remain competitive. Jumpstart service delivery using Cohesity integration with VMware vCloud Director to securely protect virtual data centers (vDCs) for single or multiple tenants at scale. Create customized private, public, or hybrid cloud offerings, while empowering tenants with self-service. Automate the protection of vDCs and vApps with Cohesity, based on tenant needs. Recover vApps, virtual machines (VMs) or individual files to their original or an alternate location. Empower your tenants with self-service for data protection. Tenant access is restricted to their environments. Restore a subset of VMs or an entire vApp instantly. Easily track usage and customized service-level agreement (SLA) metrics for each tenant. As a Cohesity Powered partner, we can quickly deliver highly differentiated, managed data protection and recovery services across data centers and natively integrate with hyperscale public clouds. Cohesity’s support for multi-clouds, multi-tenancy, self-service, and a common operating model optimize our Hosted Private Cloud for clients while helping us grow revenue and drive business agility. Our partnership with Cohesity is a game changer. With both backup and disaster recovery solutions, we empower customers to replace secondary data silos with a single unified solution—on-premises and in multi-cloud environments. Become Cohesity Powered to differentiate your value and establish customer preference for your services.